AMSTERDAM (AP) — The Van Gogh Museum in Amsterdam welcomed home two paintings by the Dutch master Tuesday, more than 14 years after they were ripped off the museum’s wall in a nighttime heist. 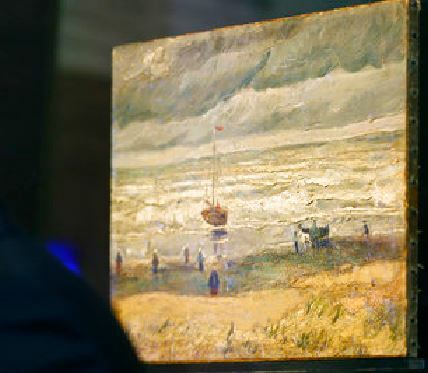 The paintings, the 1882 “View of the Sea at Scheveningen,” and the 1884-85 work “Congregation leaving the Reformed Church in Nuenen,” were discovered last year by Italian police investigating suspected Italian mobsters for cocaine trafficking. It wasn’t an easy find. The two paintings were wrapped in cotton sheets, stuffed in a box and hidden behind a wall in a toilet, said Gen. Gianluigi D’Alfonso of the Italian financial police, who was on hand at the museum to watch the ceremonial unveiling. They were found in a farmhouse near Naples as Italian police seized some 20 million euros worth of assets, including villas, apartments and even a small airplane. Investigators contend the assets are linked to two Camorra drug kingpins, Mario Cerrone and Raffaele Imperiale. 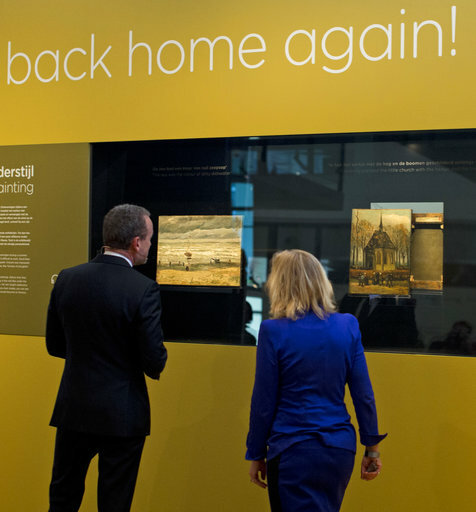 “After years shrouded in darkness, they can now shine again,” Dutch Minister for Education, Culture and Science Jet Bussemaker said as an orange screen slid away to reveal the two paintings behind a glass wall. They are now back on display at the museum before being taken to its conservation studio for repair, although they suffered remarkably little damage as thieves who had clambered up a ladder and smashed a window to get into the museum in 2002 ripped them out of their frames and fled. “It is not only a miracle that the works have been recovered but it’s even more miraculous almost that they are in relatively unharmed condition,” Rueger said. The museum director was on vacation when the call came last year from Italian authorities who believed they had recovered the paintings. He didn’t celebrate right away; he’d had calls like this before. But museum experts dispatched to Italy to check the authenticity of the works quickly turned Rueger’s doubts into delight. “It was something we had secretly been hoping for for all those years,” he said. The two small works are not typical of Van Gogh’s later and better-known works, but are still vital pieces for the museum’s collection, Rueger said. The Scheveningen seascape, with a fishing boat and rough sea under a typically gray, cloudy Dutch sky, is one of Van Gogh’s earliest works and the only painting in the museum’s collection painted during his time in The Hague. It suffered a missing rectangular chip from the bottom left-hand corner. The painting of the church in Nuenen portrayed the village where his parents lived. “He had painted as a gift to his mother, so it’s a very personal and emotional connection,” Rueger said. Rueger said the paintings are now back for good at a museum which is home to dozens of works by Van Gogh, whose paintings fetch millions of dollars on the rare occasions they come up for auction. “The security, I can assure you, is of Triple-A quality now so I’m very confident that everything is safe in the museum,” he said.